The Kansas City Association of Black Journalists at the February membership meeting decided to retain all officers in their current positions. Continuing as president is Lewis Diuguid; vice president/print, Glenn E. Rice; secretary, Anita Parran; and treasurer, Bette Tate-Beaver. Open is vice president/broadcast. KCABJ members also decided that the applications for the KCABJ Urban Student Journalism Academy will become available in March after dates for the two-week program are set. KCABJ plans to work with the Urban League of Greater Kansas City to use its classroom space at 18th Street and the Paseo for the KCABJ academy. When the academy first began in 1982, it was housed in the Pioneer Campus of Penn Valley Community College at 18th Street and Prospect Avenue. So partnering with the Urban League puts the academy back in the black community. The National Association of Black Journalists has extended the deadline to midnight Feb. 20 for people to submit proposals for workshops or panel discussions for the 2018 NABJ Convention & Career Fair in Detroit. The theme is #NABJ18: Driving Journalism, Technology & Trust. For more information go to http://www.nabjconvention.com/CFP.cfm. NABJ has decided to have its 2019 convention in Miami and its 2021 convention in Houston. In a written statement on the announcement, NABJ stated: “NABJ has held its convention in Houston twice, in 1976 and 1993, and once in Miami, in 1987. Past NABJ Convention speakers include U. S. President George W. Bush; U.S. Senator Barack Obama; and Secretary of State Hillary Clinton.” The NABJ convention in 2020 will be held jointly with the National Association of Hispanic Journalists in Washington, D.C. That is, of course, an election year. The deadline for NABJ’s Hall of Fame and Special Awards Nominations is March 1. For more information go to https://nabj.secure-platform.com/a/solicitations/login/7?returnUrl=http%3A%2F%2Fnabj.secure-platform.com%2Fa%2Fsolicitations%2Fhome%2F7. Mail this application with your $35 check or money order to KCABJ, P.O. Box 32744, Kansas City, Mo. 64111. It covers your annual membership dues. Membership entitles you to receive the KCABJ monthly newsletter sent via email and emailed monthly meeting notices. 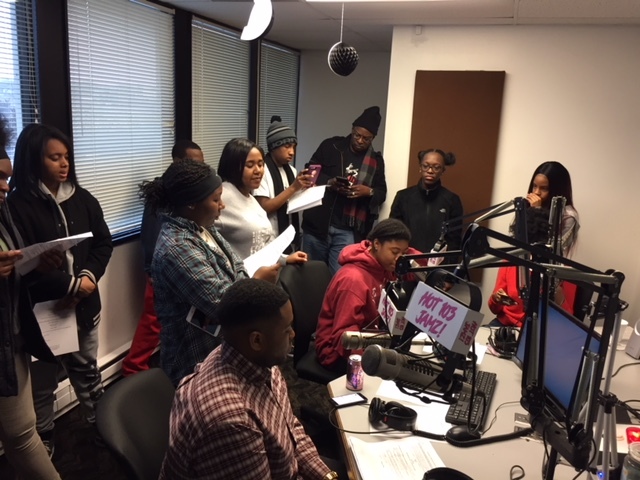 Kansas City Association of Black Journalists President Lewis W. Diuguid (with Washington High School sweat shirt) and KCABJ member Aaron Randle (pictured in the foreground at the microphone) appeared on “Generation Rap” Feb. 3 on KPRS-FM to talk about being black in the mainstream media. Eric L. Wesson with The Call of Kansas City also spoke about the importance of the black press. The event was for Black History Month. 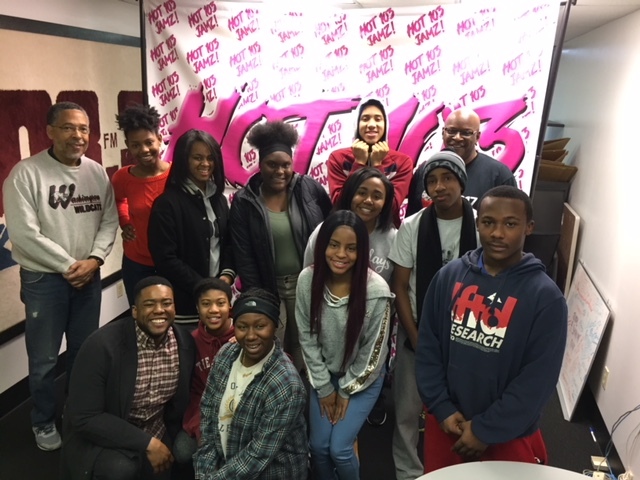 High school students from throughout the Kansas City area are responsible for the long-running radio program that is for and about area teens of color. 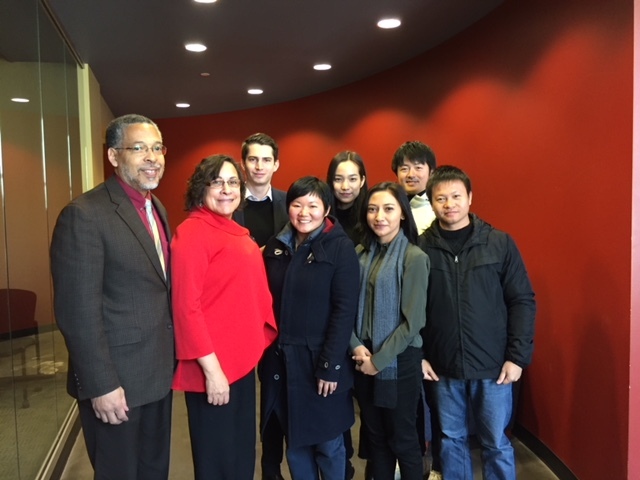 Kansas City Association of Black Journalists President Lewis W. Diuguid and KCABJ Treasurer Bette Tate-Beaver spoke this month with journalists from Hong Kong, Indonesia, Australia, Japan, Thailand and Vietnam. The visitors were invited to the United States by the U.S. State Department’s International Visitor Leadership Program. Global Ties KC at Union Station made the meeting possible with KCABJ. The journalists were particularly interested in race relations in the United States and how that affects journalists of color in mainstream newsrooms. This is the second year in a row that foreign journalists have met with KCABJ officers.